Ready to make the switch to a standing desk but not sure how to incorporate one into your current workstation? The Height Adjustable Standing Desk Converter by UPLIFT Desk is your step in the right direction. Say goodbye to bad posture and the uniformity of most modern workstations when you build your perfect desk, complete with pneumatic adjustments and dedicated space for your keyboard tray. It's ergonomic ease right at your fingertips. Ideal for cubicles and smaller desks, the standing desk converter is non-electric and easy to install for a lightning-quick upgrade to your workspace. Height range Riser - 16.7"
Which is more stable, the clamp mount or the riser mount? While they are both stable, we recommend the UPLIFT Desk Converter with the clamp mount. The clamp mount allows your keyboard tray to go below the desk surface, which puts it in a more ergonomic position. The riser model is very stable as long as the keyboard tray is at or above desktop level. Does this product ship fully assembled? The Height Adjustable Standing Desk Converter ships mostly assembled. Just attach the keyboard tray then you will be reaping the benefits of standing at your desk. Can I attach my monitor arm to this? No, the Height Adjustable Standing Desk Converter does not support an attached monitor arm. Check out our Adapt X and Pogo if you are interested in using a desktop converter with a monitor arm. Does the freestanding version of the converter connect to the desk at all? No, the freestanding Riser mount simply sits on your desktop. One benefit of the Riser Height Adjustable Standing Desk Converter is that you can easily move it, if needed. Where does the keyboard tray rest when the unit is lowered? The keyboard tray sits at desk level on the Riser Height Adjustable Standing Desk Converter. The keyboard tray sits 3.2" below desk level on the Clamp Height Adjustable Standing Desk Converter. Can I remove the palm rest on the keyboard platform? Yes, you can remove the palm rest using a hex key. What is the advantage to getting the Standing Desk Converter over the Adapt X? This Height Adjustable Standing Desk Converter moves in a swinging motion versus the vertical movement of the Adapt X. The Clamp Height Adjustable Standing Desk Converter has a much smaller footprint than the Adapt X. Is it possible to have my keyboard tray go lower than the surface of my desk? Yes, but the keyboard tray can only be lowered below the plane of your desk when you order the clamp mount with your standing desk converter. How easy is it to adjust the desk converter to standing? Going from sitting to standing with your desktop standing desk converter is as easy as pulling on the pneumatic lever and raising the Converter to standing height. I have a shallow desk, will the Height Adjustable Standing Desk Converter still work? If your desktop is shorter than 23.5" deep you must use the Clamp Height Adjustable Standing Desk Converter. The brace on the Clamp model can be adjusted to account for desktops that are as shallow as 19". Is the keyboard tray adjustable on this converter? The keyboard tray is not adjustable. It only moves up and down in a fixed position with the converter. How does the converter stay in place? The converter will lock in place once you release the height adjustment paddle. 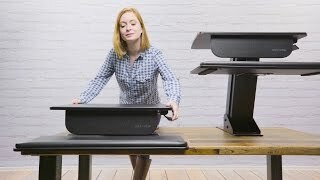 Will the weight of the items I place on top of the Height Adjustable Standing Desk Converter affect how quickly it moves? The tension that controls the speed of the converter can be adjusted to account for lighter or heavier objects that you place on your convertible standing desk. My monitor is pretty heavy, will the converter support it? Make sure that your monitor, or anything else that you place on your converter, does not exceed the weight limit of 28.6 lbs. Choose either a riser or clamp mount. The riser mount allows you to put the unit anywhere on your desk surface, but the keyboard tray sits on top of the desk and does not go lower than the desktop. The riser mount requires 23.5" minimum depth for installation. The clamp mount requires that you clamp it to the back edge of the desktop. This allows the attached keyboard tray to lower below your desk surface for a more ergonomically-correct typing position whether sitting or standing. We highly recommend the clamp mount option unless your desk requires the freestanding mount. The clamp mount requires 19" minimum depth for installation. I love this thing. It's sturdy, high-quality, easy to use, and super affordable! I work for a nonprofit so standing desks have always been too expensive. We finally got one and all my co-workers are so jealous a year later that we're all getting one! I have the chance to work from home a lot but want to come in more just so I can have the option to stand. I go to the chiropractor HALF as frequently as I used to. Easy assembly. Heavy, just great. Should have had this years ago! My company has recommended that we use a "sit stand" regime especially whilst working from home, its all too easy to sit and slouch at your desk all day. I already have a back that likes to make it self known after a few hours of sitting and try as I might I can't always assume a good, straight back, sitting position / posture. So having the opportunity to comfortably stand and work at the same time is a real benefit, however the sit stand desk that my company offers is way to big for my home office and I struggled to find a neat and well made solution and then I found the Human Solution Uplift Desk, perfect for my needs and by using the free standing model easily accommodated on my built in desk, early days yet but I think this is going to be a real help! I make a lot of conference calls and presentations on line, its always been said that you can present better and more professionally if you stand when you talk, I agree with this and the Uplift Desk contributes to this process. Great! Cons: If i had one observation it would be that the keyboard shelf is too big, I'd like the option to just have my keyboard on a neat small shelf about the same size as the desk width and key board depth although this is probably a personal thing but in the "down" position it does take up a lot of space, however the whole desk is so good that I'll improvise around that need! I ordered my new desk over the phone through a Human Solutions sales rep. She was very helpful and within 3 days I received my desk. It took about 40 minutes to assemble because the inset nuts are not exactly aligned properly. However, with a little patience and some force I was able to get the assembling screws threaded without too much problem. At work I find myself standing & sitting throughout the day and this is a nice piece of equipment. The adjustment knob allows for a light touch to raise or lower the desk. The price is very affordable. The finish and quality seems like they should last for quite a few years. I highly recommend this for anyone that does a lot of administrative type work. I have an injury from a car accident a few months ago and my doctor suggested I get a standing desk to take some of the strain off of my neck and back. Replacing my whole desk setup was kind of out of my budget after medical bulls so I thought I would try this. Assembly was pretty straightforward. Once I got it set up it worked like a charm. The keyboard platform can position a little lower than my desk which is actually a pretty nice feeling. When I need to stand up, I just push the switch on the side and lift. My back's happy, I'm happy, and best of all my wallet is happy! I have a small desk in my cubicle at work. The desk surface is attached to the wall, and my company would not allow me to remove it and get a sit-stand desk. The other converter units I've looked at were too big for my desk, or had only a clamp mount, which I can't use. My neck and back have been killing me for ages, and I was starting to really dread coming to work and settling in for long hours of pain. This converter unit has changed everything. I don't need a clamp or grommet mount. I just put this right on top of my desk and I was in business. It's really easy to raise and lower, the surface is large enough for my monitor and assorted peripherals like phone and notepads, and the keyboard platform is the perfect size for my keyboard and ergonomic mouse. With such a low price, I wasn't sure what to expect, but this product delivered on all counts. I feel so much better already! Pros: Easy set up, great price, feel SO MUCH better at work. I have a vintage wooden office desk that has served me well, but I have been interested in a sit-stand desk for a while now after they put in some standing desks at work. Unfortunately, I can't attach a height-adjustable frame to my desk without altering it completely, so this seemed like a great solution for me. I got the clamp-on version because I wanted the keyboard to be a bit lower than the desktop and it works out perfectly for me. I am about 6 feet tall and was afraid that it wouldn't go up quite high enough, but the height range is perfect. This desk converter let me keep my desk, but made it 100x more comfortable to work at! $219.00 List Price: $369.00* The list price is the same as the MSRP (Manufacturer's Suggested Retail Price). It may not necessarily be the price at which the product is sold.